This month Kingsway are releasing a 'Best Of Paradise' compilation. If that doesn't fill you with excitement it's probably because (a) you are very young or (b) you are not a funkster. London's Paradise weren't the first gospel act to integrate funk into their sound (such a credit should be given to such US gospel pioneers as Andrae Crouch and Rance Allen). But Paradise were the first in Britain and in the early '80s demonstrated that gospel was moving on from the quartet sound and the choir call-and-response fervour of old. Now with the release of a lovingly selected compilation, a new generation of believers can enjoy the groundbreaking music of London's early gospel funksters. The origins of Paradise go back to 1977 when in South London an informal aggregation The Reapers began to play together. The lineup included brothers Phil and Junior Edwards on keyboards and bass along with Victor Cross (lead vocals), his brother Billy Cross (drums) and Lincoln Anderson (keyboards, bass). The teenage aggregation were listening to the hit R&B of the day like Earth, Wind & Fire and the Falback Band as well as reggae music and both these rhythms were integrated into the Reapers' full-on gospel songs. In 1979, Billy Cross left the Reapers to follow God's call to become a pastor and his place was filled by drummer Bobby Clarke. Victor Cross organised a meeting with Juliet Fletcher, a gospel promoter and tireless behind-the-scenes worker who signed the group to her management company Oasis Management. Juliet urged the Reapers to change their name (there was already a pretty well established white Reapers group, connected to evangelist Don Double, recording albums for Kingsway Music) and Lincoln Anderson suggested the name Return To Paradise, a reference to the Stanley Clarke album 'Return To Forever'. The "Return To" was dropped at Phil Edwards' suggestion and the group settled on the name Paradise. Paradise performed at various concerts in London and elsewhere including the Greenbelt festival in 1980. It was at Greenbelt that Fletcher was approached by a precocious young convert of two years, Doug Williams, who boldly asked for a chance to sing with the group. Williams joined Paradise and turned out to be an electrifying frontman. Paradise were given a chance to support Danniebelle Hall, one time member of Andrae Crouch & The Disciples, on her UK tour. 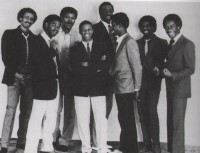 By now Paradise consisted of three Edwards brothers, Phil (keyboards), Junior (bass) and Karlos (percussion), Bobby Clarke (drums), Devon Burke (percussion), Victor Cross (keyboard), Raymon Dennis (guitars) and Doug Williams (vocals, horns). The group saw themselves as full-on gospel evangelists and in youth club gigs and other events took every chance to communicate the life-transforming power of the Gospel. Yet despite their growing popularity with UK youth both black and white, churched and unchurched, Britain's black church leadership, locked into unbiblical views of what rhythms and styles of music were appropriate for gospel proclamation, were highly suspicious. Doug Williams told journalist Andy Charalambous, "Because we weren't afraid to use contemporary sounds we were labelled as being 'worldly' especially when compared to the conservative and very traditional Pentecostal stuff. We did the outrageous thing of playing reggae on our albums and that was the 'devil's music'. It's now been accepted because it's been divorced from its theological, philosophical root - it's just now a form of music. For these young guys to claim they were a Christian band and play that kind of music - it was terrible. I remember one concert we did in Norwood. When it was finished just out of respect I asked one of the pastors in the congregation to come and pray for us and he got on the platform and prayed that we'd become Christians, and we'd just finished playing a gospel concert! "With the pastors being so suspicious of what we were about, they were very reluctant to be connected with us in any pastoral sense. I desperately feel that Christian bands should have some pastoral input and accountability. We started off as a ministry band and we really didn't want to just end up as another soul band that happened to be Christians. I think the Spirit of God spoke to us about our own personal direction and we all wrestled with that." In 1980 the group were signed to Pilgrim Records. Pilgrim were a long established Christian record label based in London who were enjoying good Christian bookshop sales with acts like Marilyn Baker, Mary McKee & Genesis and Rev William McCrea and who were gradually moving into more contemporary music with the establishment of the pop/rock subsidiary Grapevine, Pilgrim took the bold step of starting a British black gospel subsidiary Ebony Records. Victor Cross left the group before the band's first release to find success, along with his sister Sandra Cross, in Britain's mainstream reggae scene before his life was tragically cut short in a tour bus crash in France in 2000. Paradise began rehearsing and writing material for their album debut. Doug Williams told author Steve Alexander Smith in his book British Black Gospel, "Writing material was easy. We would just show up at the rehearsals with a neat idea, give guys their parts and try to arrange the basic format. It would always morph somewhat over the following weeks, but we usually arrived at a consensus for the final deal. If a casting vote was required the main writer got the shout." The album 'Paradise' was released with a striking illustration of a bird of paradise on the sleeve (an idea from the band's then manager Mike Martin) and a wide range of musical styles. The self-produced album featured hard funk "Keep The Fire", Wonder-ish balladry "It's Up To You" and a couple of lilting pieces of gospel reggae, "Light Of The World" (a showstopper at live gigs) and "Love Is Not A Mystery". Reggae gospel was a concept guaranteed to send the ultra-conservative elders of the Jamaican churches into apoplexy. Juliet Fletcher said in Buzz magazine, "Because of its association with a sinful way of life the churches are completely against any hint of reggae. If a musician tried to play the rhythm in a church service he'd be stopped by the pastor. There's actually a really terrific gospel reggae group called New Creation based in Kentish Town. But they're not allowed to play in church. The usual teaching is the beat is from the Devil." While Paradise were gigging in support of their self-titled album they played a concert in the North of England where they were introduced to two singers, Paul Lee and Paul Johnson. Most of the group wanted Paul Lee to join them because he sounded like Luther Vandross, but for various reasons Lee did not want to commit to the band. Paul Johnson was asked instead and he began to share lead vocals with Doug Williams. Paul Johnson, a member of a Seventh Day Adventist fellowship, sang in a high falsetto in a style not dissimilar to Earth, Wind & Fire's Phillip Bailey. Also joining Paradise was guitarist David Aiyeola from the Kensington Temple mega church. Despite continuing criticism from the conservative black churches Paradise continued to make strides. They supported Andrae Crouch at the Hammersmith Odeon in 1980 followed by a national tour. High profile concerts followed with appearances at the Kamperland festival (Holland) and another appearance at Greenbelt with the group gaining a growing reputation among followers of Brit-funk as they demonstrated they could hold their own against acts like Level 42, Central Line, Mirage and Freeze. In 1982 Pilgrim, perhaps sensing a major breakthrough, racketed up the recording budget for Paradise's second album 'World's Midnight'. While preparing for the album, the group began to rehearse at a studio in Holborn called Mount Pleasant, which was home to the cult British band, Gang Of Four. One of their producers, a bass player called Jon Astrop, and his colleague Phil Saatchi were impressed by Paradise. With a recording engineer called Rafe McKenna, they agreed to produce 'World's Midnight'. The band were able to use state-of-the-art recording facilities. The album was mellower than its predecessor. At that time I wrote in Buzz magazine, "This is another jazz-funk milestone for the mushrooming British 'n' black gospel scene with Paul Johnson's ear-piercing falsetto a nice balance to Doug Williams' Wonder-ish vocals. Cool changes and tricky percussion keep the whole thing cooking." The problem was Pilgrim's distribution was restricted to Christian bookshops and, as Doug Williams had told me in a Buzz interview in November 1982, "We have not yet begun to get to the non-Christian market and doing so is one of our priorities." Pilgrim didn't have the distribution machinery to get 'World's Midnight' into the mainstream and though, through their connection with Benson Records, they were able to secure it an American release with Onyx Records, even there it was with a traditional black gospel outfit. Clearly if Paradise were to fulfil their aim of connecting with the non-Christian record market, a new alliance would be necessary. And so it came to pass that in 1983 Paradise signed with a secular independent, Priority Records. Although the British Black Gospel book called it "their first major label deal" in fact Priority was a small independent run by record producer and Salvationist Christian Barry Evans. Predictably, the group pulled back on the in-your-face evangelistic lyrics and instead released a single "One Mind, Two Hearts" with a standard love song lyric. Although "One Mind, Two Hearts" clicked in clubland Priority had neither the finance nor the pluggers to promote it in the mainstream and it made 42 in the UK pop charts. By the time it was released Doug Williams had left the group. He had worked for a time with his home church in Wembley before getting involved in church planting and pastoral work with the New Life churches in South London. Today Doug is a senior pastor at Emmanuel Christian Centre in Walthamstow and a powerful conference speaker. With Paradise's move to the mainstream the group's lineup had become Paul Johnson (vocals), Phillip Edwards (keyboards), David Aiyeola (guitar), Junior Edwards (bass) and Bobby Clarke (drums). In 1984 Priority released another Paradise single, a funky cover of the Beatles' "We Can Work It Out" but neither the 7 inch nor 12 inch versions registered with Joe Public. The band continued to gig, doing a promotional tour to Portugal but their third album 'Love Is The Answer', despite containing some silkily expressive lead vocals from Paul Johnson, failed to sell in appreciable numbers. Paul left Paradise and signed a solo deal with CBS Records. But his mainstream soul albums 'Paul Johnson' (1987) and 'Personal' (1989) didn't sell either and he subsequently left showbiz to pursue a career in teaching. In 1986 with Priority on the brink of going bust Paradise made one last despairing shot at a hit, recruiting white lead singer Paul Clements for the single "Heartstrings". But when that too flopped, Paradise disintegrated. Phil and Junior Edwards went on to form the funk groups Slyce and Private In Public. Then, after several years as a session keyboard player, Phil became a musical director for several mainstream pop bands. Bobby Clarke went into session drumming and also had a brief spell with Trade Secret, a UK CCM act also featuring Les Moir and Julie Costello. Karlos Edwards also did quite a few sessions as a percussionist. For years 'Paradise' and 'World's Midnight', long deleted with the demise of the Pilgrim/Marshalls company, were all but forgotten. But thanks to interest in Brit funk by vinyl record collectors the albums started attracting big prices on eBay. Last year a French record label issued 'World's Midnight' though no one has been able to adequately explain from what source the album was licensed. The Pilgrim/Marshalls catalogue was bought in its entirety by US company Zondervan which in turn was purchased by infamous media mogul Rupert Murdoch. From there the vast Pilgrim catalogue seems to have fallen into a licensing black hole making the appearance of Paradise tracks on Kingsway all the more welcome. One thing is certain. Despite Christian journalists sometimes exaggerating their achievements (one published article claimed "Paradise had three hit albums and a single 'One Mind, Two Hearts' which made 35 in the charts") Paradise DID kick start the development of truly contemporary black gospel music in Britain. And though, later in their careers, they followed a sadly predictable path when, like hundreds of black church singers before them, they substituted bland love songs for songs about the living God in pursuit of the elusive hit, they did leave behind some fine Jesus glorifying music. And now, thanks to Kingsway, that music is at long last on CD for us all to enjoy. Great article, I'm am a young guy rediscovering this devotional funk sound and it really resonates with me deeply. Absolutely fantastic band, so refreshing and meaningful. Thanks for the article, very interesting. Would like to find more bands like this. Excellent article on my favourite band (Christian or non-Christian) of the early 80's. I saw them on numerous occasions and they were awesome live - much better than on record. I was shocked to have very recently learnt about the death of Paradise drummer Bobby Clarke in October 2009 - see http://blogs.myspace.com/index.cfm?fuseaction=blog.view&frie ndId=108220915&blogId=515566092 and read Uploader Comments at http://www.youtube.com/watch?v=rs2tSA-e6p8. I got to personally know Bobby during the Paradise days and found him to be a nice guy. This is a great article thank you for illuminating and recording the history of Christian funk in the U.K.